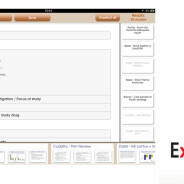 In assignment for and in close collaboration with Excerpta Medica, JAPPS has developed an iPad application for a leading pharmaceutical company in the United States. It’s an interactive tool for swiftly building, presenting, and sharing medical presentations. Along with the app, a content management system was developed to upload new content. A highly advanced protocol was developed for synchronization between a web server and the app. The app was developed natively for iOS.